The food service sector relies on innovation across all elements of its business to ensure a steady stream of feet through the doors of its establishments. Innovation comes in the form of menu changes, delivery systems, marketing vehicles, etc. A robust feeder industry has flourish over the years, that helps restaurants and people connect, be it through menu aggregation, 3rd party delivery operations, etc. Now a new idea has emerged: gaming to get people to restaurants. Treasure hunt mechanics that have been increasingly used in Brand marketing campaign have now been employed to create a novel way to discover new restaurants. 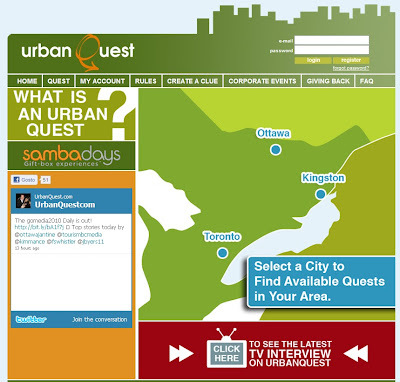 The company spearheading this is from Canada called Urban Quest. Consumers begin by signing up with Urban Quest and getting official clue packages. Sample clues are available on their website for viewing ahead of time. Participants then follow the clues from one point of the city to another, giving them a scenic tour along the way, until they reach their restaurant. Four different Ottawa quests are available and they have created similar quests for Toronto and Kingston. As mobile platforms become more approachable to owners of local restaurants we should expect a decent amount of innovation in this sector. There are already jewel examples such as an sms-driven pop-up restaurant service in Italy (have a look here). Very cool.